Depending on the size of a company, a hiring manager could receive dozens of resumes from candidates that may not be qualified for the job. The challenge is to attract the right candidates and then sort through their resumes to determine which ones have the potential for hire. Technology, by way of artificial intelligence (AI), is the future of recruiting. AI won't replace humans in the hiring process but HR should be aware of new challenges it presents. Online job boards aren't new but the use of the data they collect may be. LinkedIn has a vast storage of data from both applicants and organizations looking to hire. Use of this data, and LinkedIn's data algorithms, help match high quality candidates to jobs. HR also has the use of applicant tracking systems to help recruit and retain candidates from job posting and screening through onboarding. New startups are flooding the market with ideas for helping review resumes and discovering capable new applicants. On the candidate search side of things, Google also entered the market recently with Google for Jobs. Google for Jobs uses a programming interface to scour job and career boards all over the internet to display to job seekers in its browser. Candidates can use search terms like, "jobs near me", or other queries to explore an array of opportunities. The queries can also be filtered by categories, company type, type of hours expected, and employer, as well as the potential for commute time and employer reviews. Google has had its own experience with data algorithms as it has changed over the years to reveal the highest quality results for user searches in its browser. High Cost of Technology - One of the shortfalls of technology is typically the cost of the initial investment, installation, and maintenance. Before investing in a system, HR must weigh the benefits of the time and resources to add a new system. Unless the cost per hire is reduced, the price may be too much. Machine learning - AI works by machine-learning. This means that it is continually tweaking itself to find patterns of efficiency so initially, the system may not be immediately helpful to hiring managers. The data points and patterns of intent need to be identified over time. Algorithmic discrimination - Although the jury is still out on AI's hiring bias, some experts believe that algorithms may still lead to discrimination or implicit bias in hiring. Some candidates may be screened out if artificial intelligence is used to determine particular wording or qualifications, a common issue that leads companies to discount candidates that aren't similar to current employees. The use of AI in recruiting should be used strategically to attain the right talent while also alleviating some of the tasks that slow down the hiring process. A good practice for hiring managers is to use technology to automate some of the tasks while adding in the human element to build a better candidate experience. For instance, the use of an applicant tracking system is helpful in reducing the number of applicants to a qualified select few. 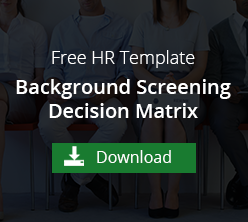 The hiring manager may also be able to narrow the hiring pool by employing a waterfall background check process. A less expensive background check is used to determine which candidates move on to the next level. At that point, they endure a background check that is more closely related to the job. Once the candidate has made it through the applicant tracking system and the background screening, the hiring manager can then use their own interview and behavioral testing methods to endorse the candidate for the job. The combination of technology and the human touch helps create a more time-efficient and cost-efficient hiring process. If many of the mundane tasks of hiring are automated, hiring time and cost is reduced, HR can spend their time on more value-added items. Used wisely, AI may ultimately help HR by creating a better experience for candidates and free up more time for the current employees of the organization.